Premium content includes DLC's in it's main part, in-game store bundles, premium ships, modules, license, customization and several other small features that can be only bought via Gold Standards or real money directly from either the Gaijin or Steam store. With this said, players should not participate in any act of buying anything with real money before learning at least the basics of the game or consulting more experienced players or staff. Game currency that a player can buy for real money or money in the game by trading and performing tasks. The use of this currency does not give advantages in battle, but can significantly increase the comfort of the game. The Spatial scanners and the Extended hulls modules are the very basic premium content and a wise investment for your future gameplays. The Spatial scanner is a CPU modifier that grants additional critical chance while the Extended hull is a hull modifier that grants additional hull strength. Other than the modifier part, they have other features for Open Space. The scanner shows hidden treasures while the Extended hull offers more cargo space for collecting those treasures. The Spatial Scanner is the absolute lowest option and first option for buying anything in Star Conflict with real money because it grants you access to blueprints, high amount of credits, vouchers, some parts and some very rare parts which are very hard to obtain without the scanner or very costly to obtain with money. The Premium license is a powerful tool if you plan on playing each day of its duration, it doubles your overall gains, gain limits (like synergy gain per OS session) and much more. The 2 extra loot searches for PvP and PvE (and other modes with loot searches) can mean the world of a difference if you want to farm rare loots, even if you don't have any other bonuses present, the license itself grants you the chance of higher gains as in higher chance of getting something very rare. The other important thing is the higher limit of synergy gain in every mode because synergy is a must-have at all times. Premium license doubles the Open Space synergy overall gains as well as the gain limit which varies with each rank. GS can also be used to buy credits if you happen to fall short on them. Customization is also a feature that uses GS, so if you feel like customizing your ship, you will need GS to do so. The Bundles Store is an in-game store that features bundles that offer specific few possible yet random drops. Every bundle offers a guaranteed drop if you buy the x5 option PLUS the drops you would get by individually buying each of the bundles (5 total). Focus on buying the x5 option rather than 1 by 1 bundle is advised. Also buying the x5 option is cheaper and offers more with the guaranteed part aside from the common random drops. 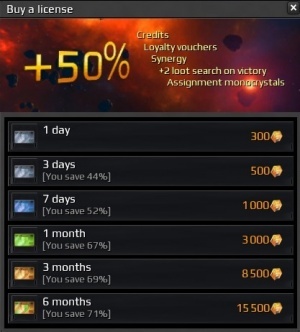 Purchasing bundles should occur when a player does not have the time to play and/or when he/she lacks a specific part or two for something specific. Purchasing something from scratch is not advised unless the buyer doesn't mind spending that much at all, or just supporting the game's development. The Premium ships are special powerful ships (in the right hands) that can be only bought or (as of lately) assembled via special parts. The non-collectible and non-DLC premium ships offer the same kind of setup (more or less) as their non-premium counterparts but with an extra buff equaling one or half a mod stat (in rare occasions more) i.e. extra damage, critical chance or similar. The collectible premium ships are a different story, they have a unique design and unique purpose. They often come with special modules available only to them. The good and the bad about them is that they are a one-trick-pony, when they do their one trick/fulfill their purpose, then that's pretty much it, although keep in mind that THAT one "trick" is a very good "trick". They can be played outside of their main purpose but that's mainly wasting a good potential in battle. Premium ships do not have an upper hand versus standard ships in stats that could make them extremely unbalanced as some would like to think. Premium ships have a specific role to fulfill and that's being able to provide that specific playstyle an experienced player needs in a whole different level. For instance a player wanting to be the best support for his team would do his best gathering (and/or buying) Brokk parts since Brokk is the only specialized engineer ship aside from Octopus (which is a special project ship), it's only natural for a good player perfecting himself in what he does best. There are 200+ ships in the game and there's probably more to come, standard ships offer everything except leisure bonuses like premiums have, premiums offer a lesser modularity in builds and plays and standard premium bonuses written in each description. For those lucky enough to perfect their skill in something, there will always be a ship that will just come perfect afterwards, may it be a standard, premium or special project, the choice is yours. The Gaijin.Net Store is the main store that offers numerous features for purchase like bundles/packs (also referred to as DLC's), GS, individual premium ships, premium license and a gift option. Steam also offers the same features as the Gaijin store. Most of the aforementioned features can be accessed directly in the game which redirects the player to the Gaijin store. The main feature of the Gaijin store are the DLC packs which offer unique ships, customization options and permanent bonuses on all kinds of gains that stack with each individual DLC purchase. Each DLC can be bought only once. The other unique feature are the gift codes. Anyone can buy a gift code and send it to their friend for a nice surprise on holidays, birthdays and similar. The remaining features such as GS packs, license and individual premium ships are pretty straightforward and if a player feels like buying anything in the store, there are frequent sales on special occasions, weekends and similar that will ease the price on whatever the player is interested in. This page was last modified on 3 April 2019, at 19:18.